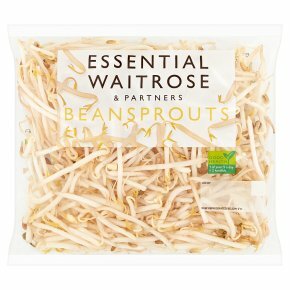 Crunchy white sprouts grown from mung beans. Washed and Ready to Cook. Do not eat raw. Do not reheat once cooled. Time: 5 minutes. Heat a dry wok for 2 minutes, add 1 tbsp oil and add beansprouts, stir fry for a further 2 - 3 minutes until piping hot. Serve immediately.